Control Keypads for MARINE AIR A/C Systems (DOMETIC). Dometic Elite Control available in gray or white. Gold bezel pictured here sold seperately. Contact us for help with order. 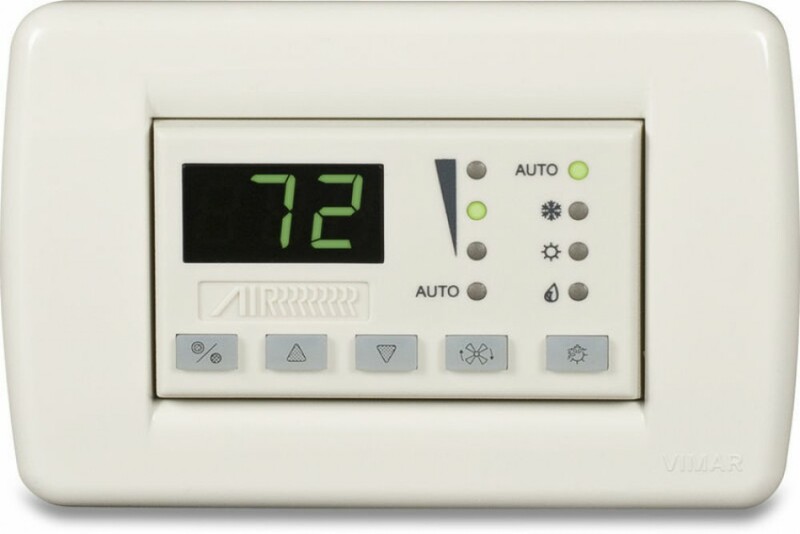 Marine Air offers a selection of electromechanical and microprocessor controls for the precise control and monitoring of cabin temperature and humidity levels. In addition, Marine Air makes advanced electronics for controlling and monitoring its chilled water air conditioning systems. The Elite Control is microprocessor-based controller designed for the precise monitoring of marine air conditioning systems, and is now available in retrofit kits for both direct expansion and chilled water applications. The Elite Retrofit Kit is used for direct expansion (DX) self-contained units and evaporators, while the AH-Elite Retrofit Kit is used for chilled water air handlers. All kits utilize the Passport® I/O circuit board and either DX or CW software. The control operates at 115 or 230VAC, 50 or 60 Hz. Elite Retrofit Kits have everything necessary to upgrade an older Marine Air control, including the MCP 3-knob control, Passport II, ECU, and ECU-Maxx controls. Each kit contains the Elite keypad/display, a Vimar® Black Poly Rondo bezel, the Passport I/O circuit board mounted in an electrical box, alternate air sensor and display cables, wiring harness, operation manual, quick reference card and mounting plate.